In terms of impacts on wildlife, wind energy has three primary benefits as an energy generation source: it is clean; it is compatible with animals and humans; and the industry is committed to ensuring minimal impacts on nature and the environment in wind energy development. This fact sheet provides information and statistics on each of these attributes. Wind energy is one of the cleanest, most environmentally friendly energy sources in the world (more). Wind energy development protects air quality, reduces the effects of global warming, and displaces mining and drilling for natural gas, coal, and other fuels. While wind energy cannot supply all of the electricity we need, using more of it will reduce the overall environmental impact of our society's energy use (more). Wind energy is also one of the healthiest energy options, and the most compatible with animals and humans (more). The modern wind turbine is far less harmful to birds and other wildlife than are radio towers, tall buildings, airplanes and vehicles and numerous other manmade objects. Bird deaths due to wind development will never be more than a very small fraction of those caused by other commonly-accepted human activities (more). The wind industry is committed to, and has demonstrated, continual innovations leading to greater protection of the environment and wildlife (more). By offsetting impacts from other energy sources, the use of wind energy improves environmental conditions for birds and other wildlife (more). Why is wind energy considered "clean" energy? Wind energy is one of the cleanest, most environmentally friendly energy sources in the world. Wind energy produces no emissions. Wind energy requires no mining, drilling, or transportation of fuel, and no disposal of radioactive or other hazardous or polluting waste. It is a renewable energy resource found in abundant supply in many regions of the United States. A single 1-MW turbine displaces nearly 1,800 tons of carbon dioxide each year (equivalent to planting nearly a square mile of forest), based on the current average U.S. utility fuel mix. To generate the same amount of electricity as a single 1-MW turbine using the average U.S. utility fuel mix results in the emissions of 9 tons of sulfur dioxide and 4 tons of nitrogen oxide each year. To generate the same amount of electricity as a single 1-MW wind turbine for 20 years would require burning 29,000 tons of coal (a line of 10-ton trucks 11 miles long) or 92,000 barrels of oil. To generate the same amount of electricity as today's U.S. wind turbine fleet (over 6,000 MW) would require burning more than 9 million tons of coal (a train of coal cars 750 miles long) or 28 million barrels of oil each year. 100,000 MW of wind energy will reduce CO2 production by nearly 180 million tons annually (assuming displacement of the fuels used today by U.S. utilities to generate electricity), or about 8% of today's utility carbon dioxide emissions. Carbon dioxide is the most important global warming pollutant. Wind energy development protects air quality, reduces the effects of global warming, and displaces drilling and mining for natural gas, coal, and other fuels. Electricity generation is the largest industrial source of air pollution in the U.S. In 1999, power plants in the U.S. emitted 13.2 million tons of sulfur dioxide and 7.9 million tons of nitrogen oxide, pollutants which cause acid rain and/or smog, and lung and heart damage. Power plants are also the largest source of mercury pollution in the U.S., releasing an estimated 48 tons of the toxic heavy metal annually into the atmosphere. This toxic heavy metal makes its way into lakes and streams, accumulating in fish and wildlife and humans who consume them (see http://www.ewg.org/reports/mercuryfalling/MercuryFalling.pdf ). Wind farms emit no pollution. Fossil fuel power plants account for about 34% of the carbon dioxide emitted by the United States, itself the largest emitter of CO2 worldwide; the Energy Information Administration reports that in 1999, U.S. power plants emitted 2.245 billion tons of CO2. Carbon dioxide is the leading global warming pollutant, threatening habitats for wildlife and air quality for humans worldwide. A scientific study published in Nature (January 2004) estimated that global warming may lead to the extinction of one million species by 2050 (BBC news report at http://news.bbc.co.uk/1/hi/sci/tech/3375447.stm). Wind farms emit no carbon dioxide. Emissions from the manufacture and installation of wind turbines are negligible. The "energy payback time" (a measure of how long a power plant must operate to generate the amount of electricity required for its manufacture and construction) of a wind farm is 3 to 8 months, depending on the wind speed at the site--one of the shortest of any energy technology. Wind farm development can support preservation of habitat from suburban sprawl and other development that often has devastating impacts on wildlife. And unlike other forms of development, the footprint of a wind project is generally small, meaning that many forms of wildlife can still use the area. What is the ecological impact of wind energy systems? Wind is also one of the healthiest energy options, and the most compatible with animals and humans. Wind has minor wildlife impacts (breaking up uninterrupted forest or grassland habitat at some locations, avian and bat collisions, noise disturbance during construction), but they are small compared to other electric generation choices. Habitat impacts from mining (coal, uranium), drilling (natural gas, oil), and compressing fuel (natural gas). Some of these effects are local, while others can extend over fairly broad areas. Habitat impacts from air and water pollution (acid rain, smog, mercury, drilling wastewater disposal - fossil fuels). Habitat impacts from global warming. Significant changes in some species' ranges are already occurring, particularly in northern latitudes. Habitat impacts from thermal pollution of water (nuclear and fossil power plants). Habitat impacts from flooding of land and streamflow changes (hydro). Habitat impacts from waste disposal (coal). Direct mortality from collisions with structures (power plant smokestacks, cooling towers) and from other sources (waste oil pits, oil tanker spills). While wind plants and their construction definitely have local impacts, the use of wind energy largely avoids more far-reaching effects of traditional energy generation. The picture with human health impacts is similar. Air pollution in particular has been linked to a number of human ailments, including heart and lung problems. Greater use of wind energy will reduce these concerns. Many extensive studies of bird collisions at wind farms have been carried out, a practice that contrasts greatly with the lack of a systematic effort to monitor direct impacts on avian species from mining and drilling, power plant emissions or pollution, or habitat loss brought on by these activities. Energy policy is all about choices. Less wind energy means more of something else-almost certainly something that is more damaging to the environment. The modern wind turbine is far less harmful to birds and other wildlife than radio towers, tall buildings, airplanes and vehicles, and numerous other manmade objects. Bird deaths due to wind development will never be more than a very small fraction of those caused by other commonly accepted human activities. All avian studies at wind farm sites show that bird kills per turbine average two to five per year or less, with the exception of a single 3-turbine plant in Tennessee that has recorded eight per turbine per year. These include sites passed by millions of migrating birds each year. At some sites, no kills have been found at all. Summaries of available wind studies can be found at www.currykerlinger.com and at www.nationalwind.org. A reasonable, conservative estimate is that of every 10,000 human-related bird deaths in the U.S. today, wind plants cause less than one. Even if wind were used to generate 100% of U.S. electricity needs, at the current rate of bird kills, wind would account for only one of every 250 human-related bird deaths. 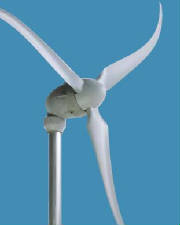 See Erickson et al, "Avian Collisions With Wind Turbines," http://www.nationalwind.org/publications/avian/avian_collisions.pdf . This estimate, again, is a conservative one-the actual number could be one in 1,000 or higher. Data on buildings, vehicles, communications towers, power lines contained in Erickson et al, "Avian Collisions With Wind Turbines," http://www.nationalwind.org/publications/avian/avian_collisions.pdf and elsewhere. Data on cats in Ohio State University Extension Fact Sheet, "Managing for Forest Songbirds," http://ohioline.osu.edu/w-fact/0006.html. Data on pesticides at http://www.currykerlinger.com/birds.htm. The wind industry is committed to, and has demonstrated, continual innovations leading to greater protection of the environment and wildlife. In 1994, shortly after raptor deaths (of eagles, hawks, and owls) in California's Altamont Pass became a general concern, the wind energy industry joined with other stakeholders (government officials, environmental groups, utilities) to form the National Wind Coordinating Committee (NWCC), a multi-stakeholder collaborative aimed at addressing the wind/avian issue and other issues affecting the industry's future. The wind industry has supported the NWCC's development of a siting handbook and avian site evaluation guidelines used by wind developers to screen sites and provide research-based analysis that can avoid potential problems. The wind industry has also supported the NWCC's sponsoring of a series of national research summits examining wind energy's impacts on birds and bats. At these meetings, scientists present the latest research findings and talk with other stakeholders about research gaps and future needs. Pre-construction wildlife surveys are common practice throughout the wind industry. Typically a wildlife consultant is retained, and efforts are made to contact state and federal fish and wildlife agencies and local wildlife groups (e.g., Audubon chapters, Izaak Walton League chapters) to identify any issues of possible concern. The consultant examines the proposed site and prepares a detailed report on impacts for review by the developer. These surveys reduce the threat to birds to minimal levels; as noted above, cats, hunters, glass windows, and communications towers are far more dangerous to birds. The industry has been conducting avian studies at wind sites across the country for more than twenty years. Over this period, post-construction monitoring of bird kills at several wind sites in a wide variety of geographic locations (Vansycle Ridge, Oregon; Ponnequin, Colorado; Foote Creek Rim, Wyoming; Buffalo Ridge, Minnesota; Searsburg, Vermont; Garrett, Pennsylvania) has validated the industry's ability to assess risk to birds and build safe projects. See http://www.west-inc.com/reports/avian_collisions.pdf. Even sites with high use by protected species need not necessarily be off limits to wind. At Foote Creek Rim in Wyoming, pre-construction surveys found that golden eagles frequently used the mesa's edge for hunting. The wind farm developer voluntarily redesigned the site to move the planned turbines 50 meters away from the rim, and the subsequent number of eagle deaths at the site has been so small that the technical advisory committee has been discontinued. See http://www.west-inc.com/reports/fcr_final_baseline.pdf. Prior to 2003, bat kills at wind farms studied were generally low. However, the frequency of bat deaths at a newly-constructed wind farm in West Virginia in 2003-far higher than those encountered elsewhere--has caused concern. In response, AWEA and several of its member companies have entered into a three-year cooperative effort with Bat Conservation International, the National Renewable Energy Laboratory, and the U.S. Fish and Wildlife Service to research wind/bat interaction and test ways to reduce bat mortality. See http://www.awea.org/news/news040303bat.html. The wind industry is currently engaged in discussions with the Federal Aviation Agency (FAA) aimed at reducing the aviation safety lighting required on wind projects. One goal of this effort is to ensure that turbine lights do not attract migrating birds on foggy nights-a phenomenon that is believed to have contributed to mass kills at some very tall communications towers and other structures in the past. By offsetting impacts from other energy sources, the use of wind energy improves environmental conditions for birds and other wildlife. Birds, bats, and other wildlife suffer habitat loss from mining and drilling for fossil fuels. An estimated 1 million acres are disturbed every year by mining related to electricity generation in the U.S. For example, the American Bird Conservancy has estimated that approximately one-third of the global population of cerulean warblers will be destroyed by loss of habitat due to mining in Appalachia (See "Determining Biological Significance," Winegrad, Gerald, http://www.nationalwind.org/events/wildlife/2003-2/presentations/Winegrad.pdf). Power plants account for 70% of the sulfur dioxide (SO2) and 30% of the nitrogen oxide (NOx) emitted in the U.S. SO2 and NOx emissions acidify rain, snow and fog. Acidity depletes calcium, resulting in weaker eggshells for birds-a problem believed to account for the widespread decline of the wood thrush in the northeastern U.S. Acidity also damages trees and deters the regeneration of forests. (See http://www.epa.gov/airmarkets/acidrain/effects/forests.html and http://www.cleanairtrust.org/acidrain.html). The earth's temperatures are growing warmer, with build-up of carbon dioxide (CO2) and other global warming pollutants a key factor. A report by the World Wide Fund for Nature determined that global warming in the Arctic is already endangering the lives of birds in the polar region. See "Arctic Warming Signals Dire Straits for Birds," Environmental News Network, http://archives.cnn.com/2000/NATURE/04/05/arctic.birds.enn/. A Defenders of Wildlife report states that "The costs of not adopting alternative energy strategies based on renewable energy sources such as wind are potentially enormous. Global warming is predicted to result in countless bird deaths through large-scale alteration of breeding habitats." See http://www.defenders.org/habitat/renew/wind.html. As of December 31, 2004, over 6,700 MW of wind power generating capacity-generating the same output as 6 medium-size coal or 3 large nuclear power plants - were online in the U.S. Producing the same amount of electricity with the average U.S. electricity mix results in the emission of 11 million tons of CO2, 55,000 tons of SO2, 26,000 tons of NOx, and many other pollutants each year. Wind energy development helps provide cleaner air and healthier habitat for wildlife.